The centre washroom is pretty spacious given that it has no fewer than three entrances! Although visually pretty much identical (graphics apart) to the 2015 Lasers, the 2016 models are built using Coachman’s ABC (Advanced Bonded Construction) methods, where the body is glued rather than screwed together. Any timber has been replaced with polyurethane (PU) materials, which is not only impervious to water, but is also lighter. Therefore, the whole Coachman range is lighter this year. The 650 is a brand new model, boasting a rear fixed-bed with not only his ‘n’ her wardrobes, but in this case his ‘n’ hers entrances into the bedroom through a dedicated centre washroom. In theory this allows visitors to use the front bed and pay night-time visits to the loo without disturbing the fixed-bed occupants. Could this be the perfect touring couple’s caravan? Read Practical Caravan's Coachman Laser 650 review to find out. And to see other Coachman caravans for sale, click here. Despite weight savings from the ABC, with an MTPLM of 1810kg, this is still no lightweight caravan. It is a good looking thing though. You’ll not only get a well-constructed caravan, but you’ll get a lot of kit (as you ought to at this price!) too. Built on Al-Ko running gear, the 650 comes with an AKS3004 stabiliser and ATC stability control as standard. Heavy-duty corner steadies are a given, and all are easy to get to. We particularly like Coachman’s attention to detail with such things as the rubber inserts around the front steadies to prevent damage from a wayward winder. An external barbecue point, mains socket and a hydraulic jacking system are all there, together with easy access electrical controls just inside the entrance door. Considering that the Laser 650 is such a large caravan, the lounge is fairly modest in proportion. That said, there’s plenty of room for four to sit comfortably. With windows aplenty, a sunroof and a large Heki rooflight the area is flooded with natural light. It’s the same when it’s dark outside too, thanks to four reading lights, ceiling lights, a couple of 'feature' lights set into the moulded sunroof sides and dimmable ambient lighting at roof level. The airy feel is helped by light coloured furnishings, too. The TV point is to the right of the entrance door, above a narrow shelf next to the fridge/freezer. A pair of branded speakers is mounted into moulded front corner panels, and faces into the caravan so should give good sound reproduction. As you would expect, the Coachman Laser 650’s kitchen is very well equipped indeed. There’s a dual-fuel hob and separate oven and grill. The microwave is hidden in its own cupboard, but is directly above the hob, 1.48m from the floor. A 140-litre tower fridge/freezer is located opposite the main kitchen area. A fixed sink/drainer means that you don’t get masses of work surface (0.39m wide x 0.61m deep), but you do get an amazing amount of storage. No fewer than three large cupboards (albeit two of them are compromised as they sit over the wheelarch) and three drawers (one of them is huge) sit in the kitchen unit. Then there’s a pan cupboard under the cooker. A crockery cupboard and cocktail cabinet occupy both overhead lockers. An omnivent completes the kitchen. The Laser 650's centre washroom is pretty spacious given that it has no fewer than three entrances! Open the door from the kitchen area, and the sink and backlit mirror face you. To the left is a Thetford electric flush loo and, thoughtfully, a linen bin. To the right is a 'beam me up Scotty' circular shower cubicle (fully lined, of course) and a heated towel rail. A duo of cupboards should take care of usual washroom paraphernalia, whilst an opaque window on the offside, and a mini-Heki rooflight keep things ventilated. A pull-cord operates the numerous lights. The lounge converts into a decent sized double bed, but at only 1.58m long, the singles would only be suitable for small children. Moving into the rear bedroom, this is what this layout is all about. The island fixed-bed (1.82m x 1.37m) has its head on the rear wall. Access is via entrances to each side at the foot of the bed. Sliding doors close off the washroom. Having the side entrances means that a TV point can be fixed onto the wall at the foot of the bed. His ‘n’ hers wardrobes are at each side of the bedhead. The one to the offside is slightly larger, but it does house the Alde heating’s header tank and pump. Cupboards underneath the wardrobes and overhead lockers ensure that there’s oodles of storage space. There’s also a handy shelf for each occupant too. There are windows to each side and a midi-Heki overhead to keep things light and airy. It goes without saying that artificial lighting is excellent. You’d have to be very careful not to overload the Coachman Laser 650, as storage abounds. Not only is there all that kitchen, washroom and bedroom storage space, but also the vast space under the fixed-bed (not ideally placed for heavy things though, being right at the rear), together with under-sofa storage at the front. Granted, the offside one houses the Alde heating system, but it still has some space, and the one on the nearside is almost empty (an external wet-locker encroaches a bit). There are four overhead lockers in the lounge area, two of which are shelved, and a couple of small cubbies tucked into the front corners. Finally, there are three drawers in the front chest unit. 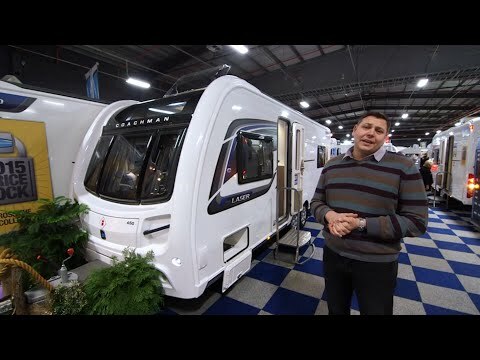 The 2016 Coachman Laser 650 certainly has a striking presence. It’s a big caravan, but unlike most side-island bed versions, it doesn’t have a big slab of white on the nearside, so looks well balanced. The beauty of having a rear island bed is that there’s no tight squeeze around the foot of the bed that you get with a side-island bed, and it’s the bedroom and attached washroom that this caravan is mainly about. In that respect, it’s brilliant. Whilst the lounge (and kitchen work surface) is a little compromised, it’s certainly no worse than many fixed-bed caravans. All in all, if you have a hefty tow car and a budget to match, then the 650 is well worth being on your shortlist.